Is this the world's best Full HD projector? It's big, beefy and boasts a stratospheric price tag, so what does the Projectiondesign M80 offer the serious home cinemaphile? Plenty. And then some. The M80 follows the Projectiondesign M25 issued last month, only this time the focus really is on giving big screen fans what they want. Chief among the features is a proprietary 3-chip DLP engine which Projectiondesign has even created a robot to help make. Naturally the M80 offers full HD 1080p processing and the latest version of the HDMI 'digital Scart' standard, and has a staggering 50,000:1 contrast ratio. Other key features include 10-bit video processor, RealColor color management suite and a range of high quality optics for the maximum picture quality. It has a quoted brightness level of 8,000 ANSI lumens. 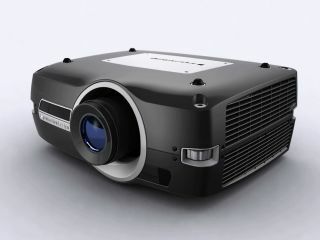 Projectiondesign has also innovated with the design of the projector itself - it has placed the digital micromirror devices or DMDs at the top of the unit. This not only makes the M80 more compact, but helps with servicing and with attaching different colour filters too. The Projectiondesign M80 will be available in Q4 this year, or early 2007. The price is unconfirmed, but will be "stratospheric" the PR says. Although they also point that the M80 will still represent phenomenal value for money.